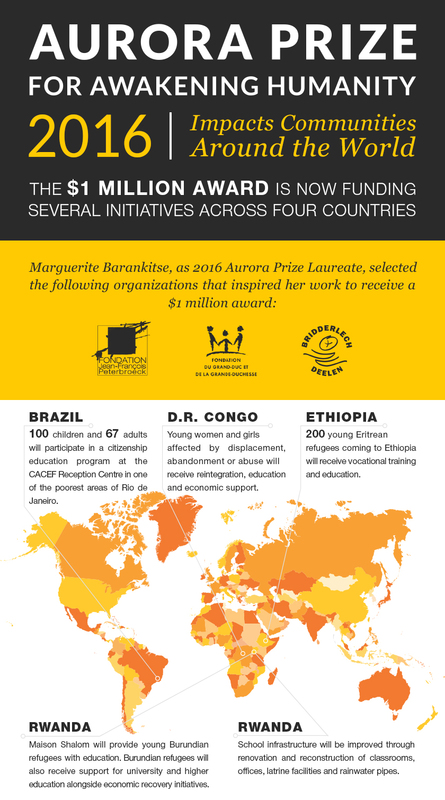 August 18, 2016 — The $1 million award for the first Aurora Prize for Awakening Humanity will fund projects in Rwanda, Ethiopia, the Democratic Republic of Congo and Brazil. The proceeds will support initiatives that are combatting child poverty and advancing aid and rehabilitation for child refugees and orphans. As Aurora Prize Laureate, Marguerite Barankitse – founder of Maison Shalom and the REMA Hospital in Burundi – received a $100,000 grant, and was offered the chance at even greater impact by being asked to nominate humanitarian organizations which would receive the Prize’s $1 million award. Ms. Barankitse chose her longtime partners: Fondation du Grand-Duc et de la Grande-Duchesse; Fondation Jean-François Peterbroeck; and Fondation Bridderlech Deelen. Today, those three organizations announced the projects they have chosen as recipients of the funds. The Fondation du Grand-Duc et de la Grande-Duchesse will use the award to support their project providing for 200 Eritrean refugees arriving in Ethiopia from Egypt. The project protects young people from trafficking and incarceration, provides vocational training and is building a training center that can accommodate at least 200 refugees per year. The Fondation Jean-François Peterbroeck (Belgium) will use the award for the “INUKA project” in DRC, which aimes to empower girls and young women who’ve been affected by displacement, abandonment, abuse or other hardship through programs aimed at reintegration, education and economic community rehabilitation. The Fondation Bridderlech Deelen plans to use the funds to offer educational opportunities to young people living in one of the poorest areas of Rio de Janeiro. This will include a citizen education program for 100 children and 67 parents to give them the skills to protect themselves against the lure of drug traffickers and trafficking. In conjunction with a Catholic Diocese in Rwanda, they will also dedicate funds to improve and upgrade school infrastructure, including renovating and rebuilding classrooms, latrines and rainwater pipes. The three organizations will also continue to support the remarkable work of Barankitse’s organization, Maison Shalom, which provides social and economic assistance to Burundian refugees in Rwanda by extending funds for education (secondary & university) and vocational training and restores dignity to orphans, street children, formerly incarcerated children or children of poverty-stricken parents. Since its creation in 1993 when Barankitse took charge of 25 orphans, Maison Shalom has aided over 30,000 orphans and children in need.